Figured I would share some of the most recent work from one of our ongoing projects. This was presented as a post at the 2016 Georgia State NSCA Clinic in Savannah, GA and the 2016 ETSU Coaches and Sport Science College in Johnson City, TN. Click here to download as Word document and click here to download as Powerpoint. You can also access this presentation on ResearchGate here. INTRODUCTION. A substantial body of literature has investigated the physiological demands and time requirements of tennis match play (Fernandez-Fernandez, Sanz-Rivas, & Mendez-Villanueva, 2009). Tennis is chiefly an anaerobic sport with an average match duration of 1.5 hrs, point length < 10 seconds and work-to-rest ratios of 1:3-1:5 between points (Kovacs, 2007). However, little is known about the accumulated physiological and mechanical loads associated with college tennis tournament play. Despite the popularity of microsensor use to quantify demands in a variety of sports, particularly heart rate (HR), accelerometry and GPS sensors, limited data exists describing the demands of tennis match play using such microsensors (Duffield, Reid, Baker, & Spratford, 2010; Gescheit, Cormack, Reid, & Duffield, 2015). Much of the research describing workloads using these microsensors has focused on other team sport such as soccer and rugby (Chambers, Gabbett, Cole, & Beard, 2015). The purpose of this study was to use heart rate sensors and accelerometers to investigate the physiological and mechanical loads associated with a single elimination college tennis tournament. METHODS. Six male tennis players (20.6 ± 1.6 yr, 180.9 ± 2.1 cm, 78.3 ± 3.8 kg) participated in this study. Athletes were members of a nationally ranked (top three) NCAA DII men’s tennis team. Prior to the tournament, each athlete was assigned and familiarized with the wear and operation of the ZephyrTM BioharnessTM (BH, version 3, Zephyr Technology Corporation, Annapolis, MD). Each athlete was equipped with a BH that was worn during match play. The BH contains a HR sensor and triaxial accelerometer which sample at 250 Hz and 100 Hz, respectively. This investigation was approved by the Institutional Review Board and all participants completed and signed an informed consent. Match Time. A total of 16 doubles and 17 singles hard court matches were played over a 4-day, single elimination tournament. Matches were divided into warm-up (WU) and match play (MP). Accelerometry. The BH was used to measure Impulse load (IL) during match play. IL is an accumulative measure of mechanical load that is equal to the sum of areas under the 3-axis accelerometry curves for all detected events. Event categories include stepping (walking, running, bounding and jumping) and other minor (3-7g; 3-7 times the force of gravity) and major events (> 7g; > 7 times the force of gravity). Mean IL, minor events and major events were calculated for doubles and singles match play, as well as tournament totals. Heart Rate. In a separate session, BH were used to determine max heart rate (MHR) for each athlete using the Yo-Yo Intermittent Recovery Test (Level 1), per previously established methods (Scott, Lockie, Knight, Clark, & Janse de Jonge, 2013). HR responses to match play were recorded with BH, and HR was categorized in one of the five following HR zones; less than or equal to 59.99% of MHR, 60-74.99% of MHR, 75-79.99% of MHR, 80-89.99% of MHR and 90-100% of MHR. 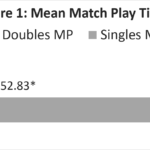 Mean time and percent of total time in each HR zone was calculated for doubles and singles MP, as well as accumulated tournament totals. Accumulated totals for each HR zone were also calculated. Statistical Analysis. Data were analyzed with SPSS (V23, IBM, Armonk, NY, USA) and expressed as means and standard deviations (SD). 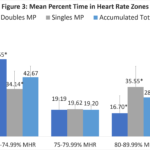 One-way ANOVA was used to analyze differences between select singles and doubles MP variables including match play time, time spent in HR zones, percent of time spent in HR zones, Impulse Load, minor events and major events. The initial level of statistical significance was set at p ≤ 0.05. RESULTS. 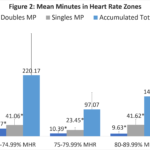 Numerous statistically significant differences were found between singles and doubles MP. 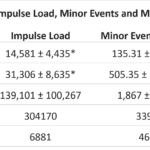 All means, SD and significant differences are displayed in Figures 1-3 and Table 1. Values designated with “*”, represent statistically significant differences between singles and doubles MP for that variable. DISCUSSION. This is the first investigation of mechanical workload via accelerometry completed in a men’s college tennis tournament, and to the authors’ knowledge, there is only one other investigation of accelerometry based workloads in tennis (Gescheit, Cormack, Reid, & Duffield, 2015).The findings of this study provide evidence of the physiological and mechanical workloads of tennis match play, that may be used as a reference to guide training and practice decisions in men’s college tennis. More specifically, this data should help coaching personnel optimize mechanical workloads, particularly Impulse Load, which may facilitate improved practice structure and prescribed training loads, enhance fatigue management and ultimately improve performance in college tennis. Future research should aim to quantify the physiological loads, mechanical workloads and fatigue associated competitive match play and tennis practice, including specific drills and simulated match play. Chambers, R., Gabbett, T. J., Cole, M. H., & Beard, A. (2015). The Use of Wearable Microsensors to Quantify Sport-Specific Movements. Sports Medicine , 45(7), 1065–1081. Duffield, R., Reid, M., Baker, J., & Spratford, W. (2010). Accuracy and reliability of GPS devices for measurement of movement patterns in confined spaces for court-based sports. Journal of Science and Medicine in Sport / Sports Medicine Australia, 13(5), 523–525. Fernandez-Fernandez, J., Sanz-Rivas, D., & Mendez-Villanueva, A. (2009). A Review of the Activity Profile and Physiological Demands of Tennis Match Play. Strength & ConditioThe Demands of a Single Elimination College Tennis Tournament The Demands of a Single Elimination College Tennis Tournamentning Journal, 31(4), 15. Gescheit, D. T., Cormack, S. J., Reid, M., & Duffield, R. (2015). Consecutive days of prolonged tennis match play: performance, physical, and perceptual responses in trained players. International Journal of Sports Physiology and Performance, 10(7), 913–920. Kovacs, M. M. S. (2007). Tennis physiology. Sports Medicine , 37(3), 189–198. Scott, B. R., Lockie, R. G., Knight, T. J., Clark, A. C., & Janse de Jonge, X. A. K. (2013). A comparison of methods to quantify the in-season training load of professional soccer players. International Journal of Sports Physiology and Performance, 8(2), 195–202.